Dental bonding is a quick and painless procedure that can give a gentle face-lift to small imperfections in your smile as well as repair decaying teeth. At the Anacapa Dental Art Institute, Dr. Jivraj uses dental bonding to repair chipped, cracked, discolored or otherwise unsightly teeth. Dental bonding is a procedure in which Dr. Jivraj affixes a tooth-colored resin material to the flawed tooth in order to cosmetically repair it. After it is applied, shaped and smoothed to repair the imperfection, it then is hardened with a special light that activates the resin so it bonds with the tooth. The result is a repaired tooth that looks beautiful and performs like the real thing. Dental bonding can be a more affordable solution than veneers, though porcelain veneers can provide longer lasting results. The advantages of dental bonding are simply that it’s inexpensive, removes the least amount of tooth enamel and doesn’t require the assistance of anesthesia, unless being used to fill cavities. As veneers and crowns are manufactured in a laboratory, dental bonding has the added advantage of being done fully in-house, which makes it the faster choice, most of the time taking only one visit to Dr. Jivraj. Though dental bonding has a shorter lifespan and can stain more easily than veneers, it is still a great solution when used on smaller cosmetic imperfections in your smile. It is also best for areas of teeth of low bite pressure, like the front teeth. 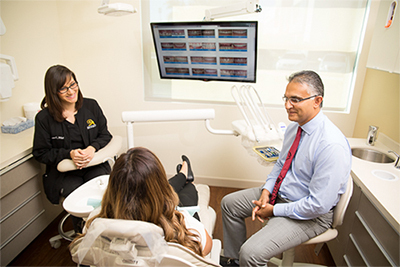 When trying to figure out which procedure works best for you, whether it will be dental bonding, porcelain veneers or other, your best bet is seek the expertise of the award-winning prosthodontist, Dr. Jivraj.